After almost sixteen hours of play, Malta's ".RUIT.HORA." emerged victorious in 888poker's XL Blizzard Event #32 - $500,000 Main Event for $91,847. The $500,000 guarantee was smashed with the 1,783 entries and 531 rebuys generating a $543,790 prize pool. A total of 207 players were paid at least a min-cash of $598 for more than double the $250 tournament buy-in. At least five 888poker Ambassadors entered the tournament. Sofia "sofialovgren" Lovgren was out before the late registration period was over while Chris "888Moorman" Moorman and Ana "anamarquez" Marquez were also both on the rail before the money hit. Dominik "888Dominik" Nitsche (87th - $1,088) and Martin "MJacobson888" Jacobson (148th - $707) both had more success than their fellow ambassadors by going deep into the money. The final table began nearly twelve hours after the tournament kicked off with Lithuania's "Estrellittaa" bowing out in tenth place for $4,568, bubbling the final table. "MisterN411" began the final table action in the lead with almost double the chips of the second place stack of ".RUIT.HORA." 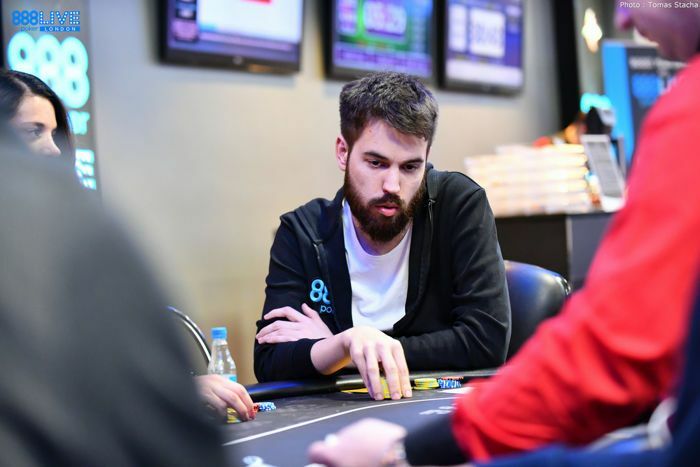 Greece's "Gkap13" was first to go at the final table in ninth place for $5,873 when his or her ace-three didn't get there against the pocket sixes held by Brazil's "catcholao". Shortly after, Germany's "polomichi18" was ousted in eighth place for $10,332 when their ace-five proved to be no good against the pocket fives held by ".RUIT.HORA.". "DeucesofDuc0" then eliminated Bahrain's "MFA1770" in seventh place for $15,498 with king-queen holding strong against queen-jack. ".RUIT.HORA" took the chip lead after eliminating "catcholao" in sixth place for $20,664. Next to go was Russia's "petushki777" in fifth place for $25,830 after this player jammed a short stack with pocket nines only to run into the pocket tens held by "MisterN411". The chiplead changed hands several times. First, it went back to "MisterN411" before ".RUIT.HORA." reclaimed it. "DeuceofDuc0" was able to grab the lead before extending it to more than half the chips in play by eliminating Russia's "Gunning_4you" in fourth place for $35,346. The money was all-in preflop, and by the end of the hand, the pocket sevens held by "Gunning_4you" nailed a set only to lose to a flush with "DeuceofDuc0" connecting with their ace-jack suited. "DeuceofDuc0" was able to extend their lead to more than double both of the opponents combined. This player amassed even more chips heading into heads-up battle. 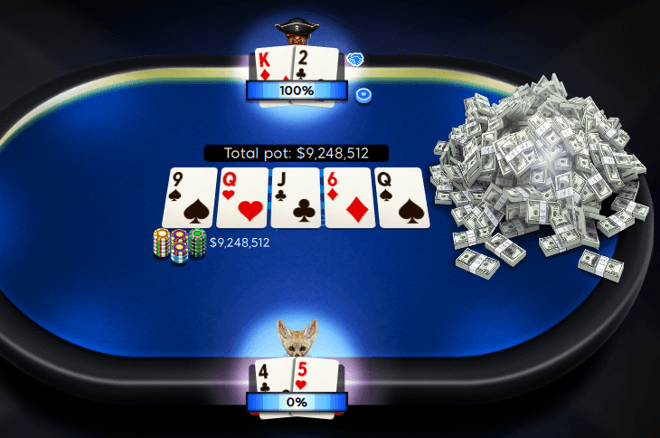 "DeuceofDuc0" nailed quads with pocket threes in an all-in preflop flip against king-seven to eliminate "MisterN411" in third place for $50,029. "DeuceofDuc0" entered heads-up play with a 4:1 chip advantage but ".RUIT.HORA." was able to battle back to almost even the stacks. The second to last hand was the game changer when ".RUIT.HORA." caught their opponent bluffing and made a big hero-call with fourth-pair to leave the opponent with about three big blinds. ".RUIT.HORA." ultimately jammed the button the next hand with king-deuce and was able to hold against five-four to eliminated "DeuceofDuc0" in second place for $65,364. In the first 205 minutes of play, 1,847 players and 624 rebuys made for a total of 2,471 entries. They created a total prize pool of $74,130 with a first prize of $11,713. It took a while to get towards the money, but in the end, it was Canada's "BTIPPPPP" who was the last player finishing empty-handed, bubbling the XL Blizzard #33 - $50,000 Mini Main. After making the money, it took a long time before the tournament was down to the last nine. Hours before that, Ana "AnaMarquez" Marquez had finished in 88th place for a cash of $141. After nine hours of play, the remaining nine players made the final table and went on to play for the $11,713 first prize. For "dyonvlaar12" (ninth - $867), "GoinInDry" (eighth - $1,401) and "BonikBim" (seventh - $2,090) it wasn't a big success on the final table as they left quite early on. It was all "Ney_Anderson" at this stage because the Brazilian player eliminated the players one by one. The tournament saw "j_fletcher" leave in sixth place ($2,802). Not much later, "stradale_430" lost with ace-ten against pocket tens to get eliminated in fifth place for $3,514. For "aghghghghghg," the tournament ended in fourth place for $4,781 after losing all the chips with king-five against the ace-jack of the chip leader. With three players left, Cyprus' "jiujiteiro" moved in with ace-seven but once again saw the Brazilian chip leader scoop the pot with pocket sevens. "jiujiteiro" finished in third place for $6,368 while "Ney_Anderson" and "schgewara" made a deal for most of the remaining prize money. After the deal, they both flopped top pair and got all the money in. "Ney_Anderson" had the worst kicker but hit the eight on the river. The Brazilian player won the tournament for $10,792 while Germany's "schgewara" received $9,713 for finishing in second place. The first event of the day started thirty minutes before the Main Event and the XL Blizzard #31 - $100,000 Mega Deep attracted a field of 460 players. They were all chasing the first place prize of $25,802 while every finalist would receive a minimum of $2,254. The final four players made it a five-figure score. In the end, "CoinShipper" finished in fourth place, receiving the prize of $10,592. Before the final heads-up, "IOwnU888" got eliminated in third place for $13,920. The deciding battle for the victory was won by Sweden's "Madeon1994", who defeated the Russian regular "josef_shvejk". The runner-up received $19,012 while the winner got $25,802 in their account. The smallest of the events to start on the last day of the 888poker XL Blizzard Series, had a buy-in of just $5.50. The $15,000 888poker guaranteed for the Micro Main Event was easily surpassed as a massive turnout of 3,527 gathered to create a prize pool of $17,640. It all ended with a heads-up deal between Ukraine's "ExValue1" and "Sizzlinbetta" from Mexico. The latter mentioned had to settle for second place and $2,092 while the winner received $2,641 for their victory. While the 888poker XL Blizzard Series has concluded, the next 888poker XL Series is right around the corner! The XL Inferno will run at 888poker from May 16-26. Be sure to download 888poker via PokerNews and join the fun!